Mailing address: Departamento de ClÃ­nica Infantil,Odontologia Preventiva e Social Faculdade de .... contamination, immersion or sterilization) were free of LPS. 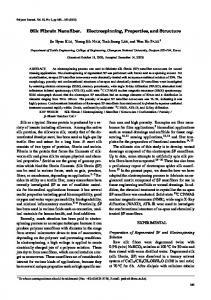 of this study was to compare some methods of soil sterilization and soil microbial P (Pm) release in .... biological properties of soils are in Tables 1 and 2.
systematic study of possible effects of sterilization on optical fiber properties has been ... method with which very high sterility assurance levels can be achieved. 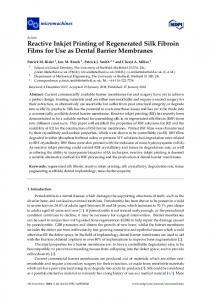 doi:10.4236/jbise.2011.45050 Published Online May 2011 (http://www.SciRP.org/journal/jbise/). 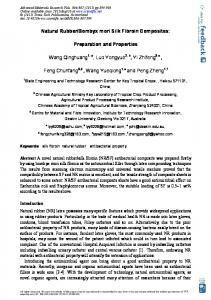 The effects of different sterilization methods on silk fibroin Yahong Zhao, Xiaoli Yan, Fei Ding, Yumin Yang, Xiaosong Gu Jiangsu Key Laboratory of Neuroregeneration, Nantong University, Nantong, China. Email: [email protected], [email protected], [email protected], [email protected], [email protected] Received 10 March 2011; revised 17 March 2011; accepted 17 April 2011.
nologies will be appropriate for silk and, for most instances; the more popular methods are adequate for the silk material . But for selecting the best sterilization method, we not only focus on the efficacy of a sterilization process in terms of effect of killing microorganism and the nature of the residuals formed, but also take into account the effect of sterilization processes on the properties of the silk material, which is often ignored. Obviously, the effect of sterilization processes on the properties of the silk material should be as minor as possible. Before the sterilization method is endorsed for silk, its effects on the properties and end performance of silk should be well investigated . 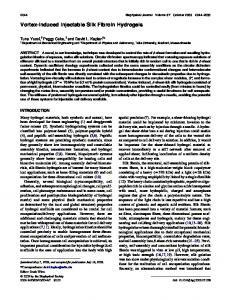 The goal of this work was to investigate the changes in the color, molecular weight and structure of silk produced by three different sterilization methods (steam, gamma radiation and ethylene oxide) with different dose or time period of sterilization by means of FT-IR (Fourier Transform Infrared Spectroscopy) spectroscopy, Xray diffraction, mechanical properties and assessment of molecular weight. 2. 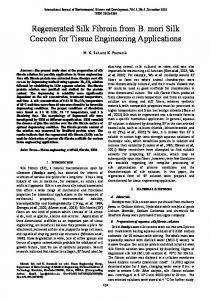 EXPERIMENTAL METHODS AND MATERIALS 2.1. Materials Raw silk fibers (Bombyx mori cocoons) were bought from Xinyuan sericulture company, Hai’an, Jiangsu, China. All other reagents used in the study were of analytical grade. 2.2. 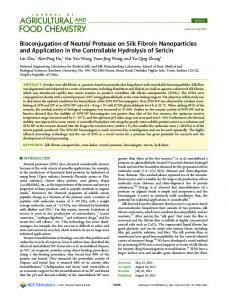 Preparation of Silk Fibroin Raw silk fibers’ sericin coating was removed via degumming process of boiling in 0.5% (w/w) aqueous Na2CO3 solution for 30 min at 100˚C for three times . 2.3. Steam Sterilization Steam sterilization is a relatively simple process, and it kills microorganisms by destroying metabolic and structural components essential to their replication. 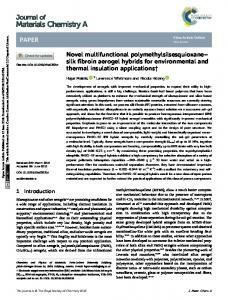 In this study the silk fibroin samples were exposed to saturated steam at 121˚C for 30 min at a pressure of 115 kPa . 2.4. Gamma Irradiation In this study, the gamma irradiation sample was carried out in a Nantong Meikeer irradiation company (Jiangsu, China). Radiation sterilization utilizes ionizing radiation from a cobalt-60 (60Co) isotope source with sterilization achieved when highly reactive free radicals induce breaks in the DNA double helix of microorganisms, preventing replication . The most commonly validated dose used to sterilize medical materials is 25 kGy. In this study, samples were exposed to 10 and 20 kGy gamma irradiation using a 60Co source, respectively. Copyright © 2011 SciRes. 2.5. Ethylene Oxide Sterilization  The ethylene oxide sterilization process utilizes ethylene oxide which has bactericidal, sporicidal and virucidal effects resulting from alkylation of sulphydryl, amino, carboxyl, phenolic and hydroxyl groups in nucleic acids causing cell injury or death . In this study, samples were exposed to ethylene oxide, the concentration of which was 800 g/m3, at 50˚C for 0.5 h, 1 h, 2 h, 4 h, 8 h respectively and aeration for 10 days. 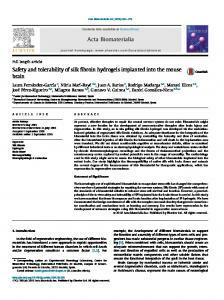 After aeration, no ethylene oxide residue was tested in silk fibroin samples . 2.6. FT-IR Analysis FT-IR spectra were obtained with Nexus model 870 Fourier Transform IR Spectrophotometer. Dry silk fibroin was ground with KBr powder and compressed into discs for FT-IR examination and analyzed with a model Nexus 870 Fourier transform infrared spectrophotometer (Nicolet Instruments Co, Madison, WI, USA). FT-IR was used to study changes in the chemical structure of the silk fibroin samples after different sterilization procedures, which were steam heated for 30 min, gamma irradiated with 10, 20 kGy, or exposed to ethylene oxide for 8 h.
2.7. X-Ray Diffraction Analysis X-ray diffraction patterns in the 2 range of 4˚ to 60˚ were obtained for the samples of unsterilized and sterilized at room temperature using a scan rate of 10˚ (2)/min at 40 kV and 40 mA (x’TRA, Switzerland ARL). The samples of sterilized silk fibroins were steam heated 30 min, gamma irradiated with 10, 20 kGy, or exposed to ethylene oxide for 8 h.
2.8. Mechanical Analysis The tensile strength of silk fibroin sterilized with different methods was measured on a J-100 N strength-testing machine with or without the sample being soaked in phosphate buffered solution (pH 7.4) at 37˚C. The silk fibroins processed with steam sterilization were postdried, and the samples sterilized by other methods were treated in the same way. The strand of silk fibroin with the same thickness was pre-measured. The sample length was 20 mm. The tensile speed and gauge length were set as 10 mm/min and 60 mm, respectively. The crosshead speed was maintained at 200 mm/min. Every sample was tested for 6 times. for 30 min and then dialyzed against milli-Q water in dialysis tubing (molecular cutoff 12 kDa) at room temperature. Milli-Q water was changed every 6 hours. After 72 h of dialysis, the samples were removed from the cassettes and stored at 4˚C . Samples were reduced and run on a NuPage 4% - 12% Bis-Tris gel in electrophoresis buffer. Prestained Protein (NEB #P7702) was run as the molecular weight marker (6 - 175 kDa) on all gels . Gels were stained with the Commassie® G-250 Stain (Bio-Rad, Catalog #161-0786). Digital images of the gel were captured with a GS-800 Calibrated Densitometer (Bio-Rad). 3. RESULTS AND DISCUSSION 3.1. Visual Inspection Visual inspection of all samples was performed before and after sterilization. A color change from white to yellow in silk samples was observed after exposure to steam, and the intensity of color change increased with increasing heating time of sterilization. The yellow color darkening of the steam-sterilized silk may result from the Maillard reaction  between NH2 and OH groups. However, no obvious color change was found in silk samples sterilized by using ethylene oxide or gamma irradiation. Figure 1. FT-IR spectra of unsterilized silk fibroin (a) and silk fibroin sterilized using steam (b), gamma irradiation (c), and ethylene oxide (d). 3.2. FT-IR Analysis Fig.1 showed the FT-IR spectra of silk fibroin (a) and silk sterilized using steam (b), ethylene oxide (c), and gamma irradiation (d), respectively. They were showed absorption bands at 3307.0 cm–1 (ν N-H), 1647.5 cm–1 (amide Ι), 1516.1 cm–1 (amide II), 1231.9 cm–1 (amide ш). And it could also be found that there were absorption bands at 1516.1 cm–1 and 1067.4 cm–1, which were related to β-sheet conformation. From Figure 1, we can see that the peak shape at amide Ι region change a little by steam sterilization (b). This result seems that steam sterilization process results in increasing beta-sheet conformation. And ethylene oxide (c) and gamma irradiation (d) sterilization process did not modify the silk fibroin’s composition and did not change the crystal conformation of silk fibroin either. 3.3. X-Ray Diffraction X-ray diffraction curves of silk fibroin and silk fibroin exposed to different sterilizations were shown in Figure 2. They were almost the same and all showed a very broad peak at 2 = 20˚ and a little peak at 2 = 24˚, which was a typical characteristic diffraction pattern of silk fibroin. It belonged to β-crystal (silk II). The results suggested that the unsterilized silk fibroin and silk fibroin exposed to different sterilizations all had β-sheet crystal structures and the sterilization process did not Copyright © 2011 SciRes. Figure 2. X-ray diffraction curves of unsterilized silk fibroin (a) and silk fibroin sterilized using steam (b), gamma irradiation (c), and ethylene oxide (d). 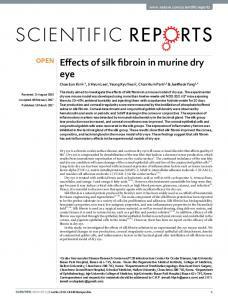 change the conformation of silk fibroin, which confirmed the results of FT-IR. Figure 3. The average percent of maximum fracture strength of silk fibroin unsterilized (a), and sterilized using steam (b), gamma irradiation (c), and ethylene oxide (d) (n = 6). *p < 0.05 versus the unsterilized group. and ethylene oxide sterilization for both groups were compared to unsterilized group. 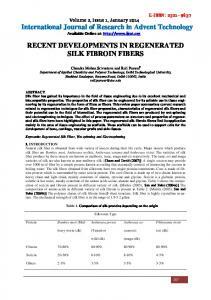 But there was marked difference between silk fibroins sterilized using steam and other silk fibroin samples. 3.5. SDS-PAGE In order to understand the distribution range of silk fibroin peptides processed with different sterilization methods, the relative molecular mass of the protein was measured by SDS-PAGE with 12% gel. As shown in Figure 4, both large and small molecular weight of silk fibroins was affected with sterilization. Compared with unsterilized silk fibroin, the intensity of the 25 kDa band for samples exposured to gamma irradiation and ethylene oxide decreased, suggesting that the 25 kDa chain was cleaved and degraded to smaller peptides. In addition, the intensity of light chain decreased from 10 to 20 kGY. It was likely that the peptides within this smear decreased in size with increased dose of irradiation. Corresponding bands were found in all samples at large molecular weight, which was likely due to minor degradation of the heavy chain during sterilization processing and the difficulty in breaking the tight β-sheet structure of crystalline region during processing sterilization. But from the pattern, the intensity of all sterilization bands especially that of gamma irradiation and ethylene oxide weakened. These results indicated that both the intermediary regions of the fibroin as well as regions within the heavy chain (possibly those between the crystalline regions) were degraded by sterilization. 3.6. Steam Sterilization It has been reported that the high temperature, humidity and pressure used during steam sterilization can lead to Copyright © 2011 SciRes. Figure 4. SDS-PAGE spectra of unsterilized silk fibroin (1) and silk fibroin sterilized using steam (2), gamma irradiation10, 20 kGY (3,4), ethylene oxide (5) and Marker (6). 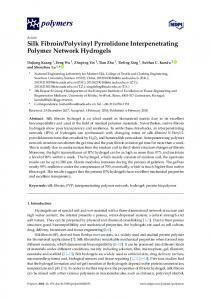 hydrolysis, softening and degradation of biomedical polymers . It was investigated that the high temperature and moist environment created by the autoclave sterilization process was found to change the color of silk fibroin and the color of silk fibroin darkened with increasing time period of sterilization. However, the chemical structure of silk fibroin sustained during steam sterilization as shown in FT-IR and X-ray spectrum, and the SDS-PAGE pattern of silk fibroin upon steam sterilization showed a slight decrease in molecular weight. The result seems that steam sterilization process results in increasing beta-sheet conformation. The mechanical property changed a lot with contrast to other silk fibroin samples. 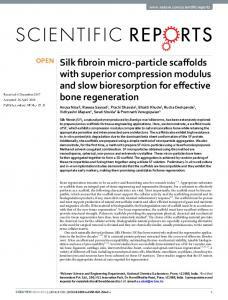 This was possibly due to little degradation of silk fibroin occurred in the process of steam sterilization. Thus, there are some limitations for steam sterilization concerning batch process scale-up. 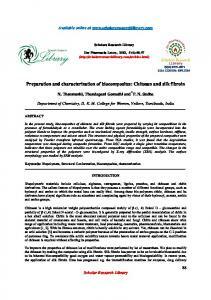 acetylamino group, and results in significant degradation in the noncrystalline region of silk fibroin. This is because the radiation induces the difference in the amino acid composition, especially the aromatic series amino acid such as tyrosine and phenylalanine. 3.8. Ethylene Oxide Sterilization Ethylene oxide is one of the most widely used commercial sterilization processes in the medical device and care industries. However, the alkylating reactions, which this process utilizes to achieve sterilization, have also been reported to react with the functional groups of some biomedical materials . Although the side chain such as carboxy group, amino group, hydrosulfide group and hydroxy group on the molecular weight are reactive and provide a mechanism for side group attachment using a variety of mild reaction conditions . FT-IR spectra and X-ray spectrum showed that ethylene oxide used in sterilization process does not affect the chemical properties and structure of silk fibroin. From the SDS-PAGE spectrum, the molecular mass decreased a little. Therefore, ethylene oxide sterilization can be considered to be the most adequate sterilizing agent for silk fibroin, despite ethylene oxide sterilization associated with residues, toxicity, flammability, and environmental risks. 4. CONCLUSIONS In summary, the experiment results indicated that silk fibroins were weakened by thermal methods of sterilization and steam sterilization also darkened the color of silk fibroin. Silk fibroin can be processed with gamma irradiation without significant loss of tensile strength but the molecular weight decreased with the increase of irradiation dose. 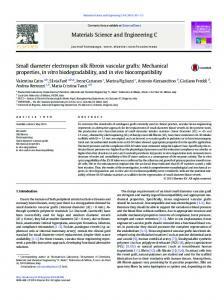 Except for some degradation on molecular weight, silk fibroin sterilized with ethylene oxide does not change its morphology or β-sheet structure, and its impact on mechanical property can be ignored. Therefore the ethylene oxide sterilization method can be considered as the most adequate sterilization method for silk fibroin. Program of Jiangsu Education Department (Grant no. 07KJA31025) and Program for New Century Excellent Talents in University (NCET07-0466) are gratefully acknowledged. Veparia, C. and Kaplan, D.L. 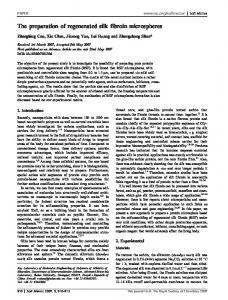 (2008) Silk as a biomaterial. Progress in Polymer Science, 32, 991-1007. 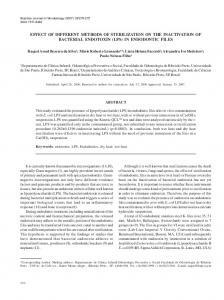 Report "The effects of different sterilization methods on silk fibroin - Scientific ..."